Even if you’ve never seen Pilobolus in concert before, you’re probably familiar with the acrobatic dance troupe’s work. After starring in a Ford commercial over a decade ago, in which the dancers’ silhouetted bodies became the car, the commercial opportunities kept coming: a high-flying performance at the 79th annual Academy Awards, appearances on Sesame Street, Oprah, Ellen, The Today Show, Late Night with Conan O’Brien and more. Through the commercial success, Pilobolus has continued to create and tour repertoire to theaters around the globe. Since its founding in 1971 by a group of Dartmouth college students, the company has toured more than 120 works to 65 countries. Pilobolus brings its acrobatic style of dance to Texas in January, performing the company’s first full-length work, Shadowland, as part of the TITAS Presents series at the Dallas City Performance Hall on Jan. 13 and 14, at San Antonio’s Tobin Center for the Performing Arts Jan. 18, and as part of Houston’s Society for the Performing Arts (SPA) series Jan. 20 at Jones Hall. Mark Fucik, currently the creative director of Shadowland, was one of the dancers on whom the production was originally created. He danced with Pilobolus from 2001 to 2005, touring with the original cast for two years. Most recently, Shadowland finished a four-year tour in Europe. 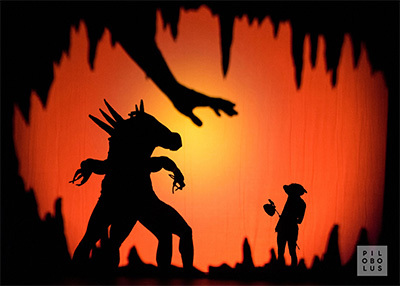 Pilobolus responded by having its dancers mold their bodies together in front of a light to create a shadow effect. 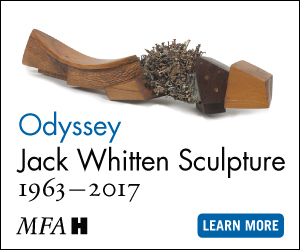 “Then we thought, ‘Why not make a piece out of this?’” continues Fucik. The result was a visually arresting coming-of-age story about a girl who falls into a dream world and is confronted with various trials, all of which help her figure out who she is. 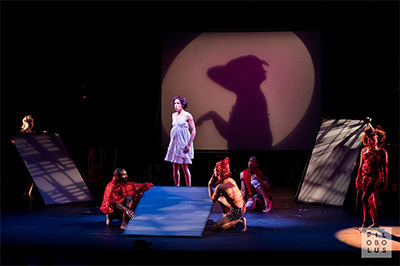 Shadows, of course, figure prominently in Shadowland; behind the scenes, they are what Fucik refers to as “composite images,” in which four to seven dancers roll up together to create one image. Nothing is projected, besides color on the backdrop. The costuming is bare bones — skin-tight shorts and sports bras — as the shadow images require crisp lines, and skin-on-skin contact between the dancers is a necessity to produce the correct images. There are also monitors on the sides of the stage so the dancers can check their shapes, and the stage floor is “spiked like confetti” so all nine dancers hit their marks consistently. Shadowmaking is challenging, to say the least: “If you’re off by a centimeter, the shape can change so drastically that it doesn’t read as it should read,” says Fucik. The lighting is also key, and in Shadowland, the dancers have the unique responsibility of controlling it. There’s one main light the dancers cover and uncover throughout, plus multiple smaller lights located around the stage. Besides the shadow making, one of the biggest challenges this production presents is that the dancers are almost always seen onstage, even when they’re not a central part of the action. “The question becomes, ‘How do you move around the stage if you’re not part of the drama?’ You have to get your props ready without attracting attention,” says Fucik. And props there are — hundreds of them, in fact, including everything from a vase of flowers to a coffee cup, which are used to fill out a scene. “You can’t really make a small coffee cup out of a body part, so there are some things we use props for,” explains Fucik. 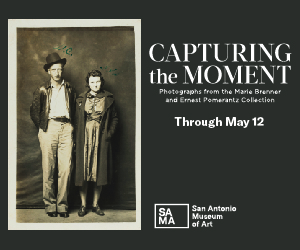 The finale of the show is tailored to the city in which it’s being presented, with special imagery projected. Fucik, who has numerous family ties to Texas, recalled fond memories of summers spent in the Lone Star State: “I remember how my grandmother would make molasses cookies and we’d crumble them over Blue Bell ice cream,” he says. Like Fucik, the company itself has a history with Texas. TITAS Presents first presented Pilobolus in 1983, long before the AT&T Performing Arts Center opened. 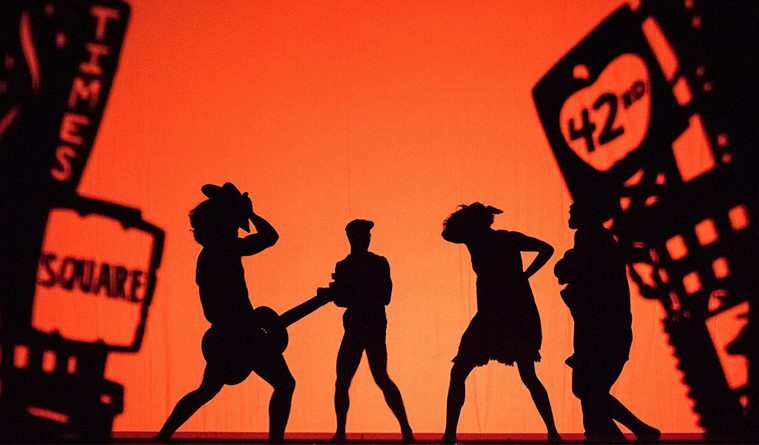 This tour marks the second time Pilobolus will have performed at the center since its opening seven years ago.